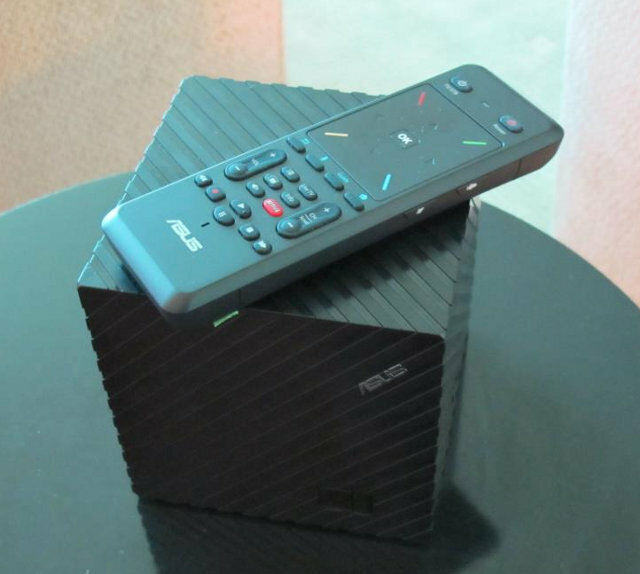 Instantly add Google TV to your HDTV with the ASUS Qube. Qube with Google TV offers both motion control and voice search that integrates Google Play, Chrome™, YouTube™in one compact device. With access to over 100,000 movies and TV shows* from Netflix and Amazon Instant Video, plus numerous apps, videos and games from Google Play, ASUS Qubewith Google TV is the perfect media content device. ASUS has developed the unique Qube interface, which displays functions via a rotating on-screen cube shape. The advanced remote control supports motion sensing for gaming and other applications. Customers can also control Qube with Google TV from their Android smartphones and tablets using the Mobile Remote app, available through Google Play. ASUS includes 50GB of WebStorage cloud space with every Qube with Google TV. Anandtech reports that the device is based on Marvell Armada 1500 Google TV platform. They also spent some time on the device on Asus booth, and noticed the transition animations weren’t really smooth on this demo system. The remote is dual sided with a a full QWERTY keyboard on one side, and a simpler remote on the other including a navigation button and a Netflix button.. The remote also comes with a built-in mic for voice control, and an integrated gyro. The board features two HDMI ports, an ethernet port, WiFi, and a USB port as well. The Qube will ship with an IR blaster for $129 at the end of Q3, according to CNET.